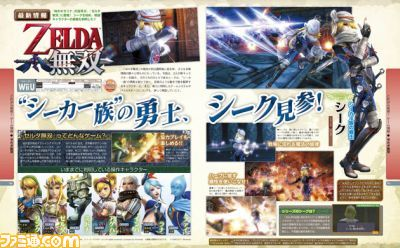 The roster for the Koei Tecmo-Nintendo crossover continues to grow as three new playable characters have been revealed for Hyrule Warriors. The new characters announced today, via a tease from Famitsu, are Sheik, Princess Ruto, and Darunia, all characters that play prominent roles in Ocarina of Time. With these additions, only three of the sages from Ocarina of Time remain unaccounted for: Rauru, Nabooru, and Saria. It was also mentioned that Gold Skulltulas will also play some part in the game, though they were only teased with nothing detailed about them. This now moves the roster of playable characters in Hyrule Warriors to 10. The previously announced characters were Link, Zelda, Impa, Midna, Agitha, Lana, and Fi. And with this announcement, we can check off 2 more names from our Most Wanted list. More information on these characters is expected to come when the Famitsu issue releases early next month. We’ll be sure to let you know what comes from it, as well as any new information that comes out for Hyrule Warriors as we build up to its release, both next month in Japan as well as on September 19th and September 26th for Europe and North America respectively.